If you follow me on Pinterest then I'm sure you'll be no stranger to monochrome interior and copper decor. Since moving into our own place yesterday, my homeware wishlist is already the length of my arm. Today, I thought I would put together a few pieces which I have been lusting after for our bedroom. 1. H&M Textured Blanket | £24.99 As someone who has a growing obsession with H&M I had to narrow this list down to make sure that it wasn't all H&M. 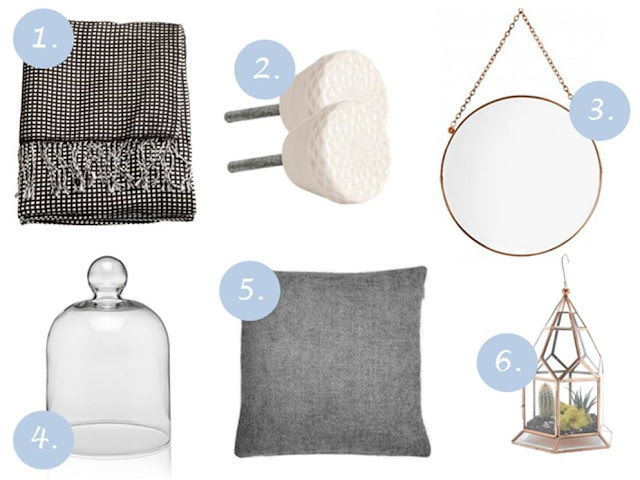 Since deciding on a grey, white and pink theme for our bedroom, I have been gathering inspiration from budget friendly shops to put together a few matching accessories. 2. H&M 2 Pack White Knobs | £7.99 After putting the Ikea Chest of 8 Drawers on my latest wishlist, I went out and purchased them not long after. Since searching Pinterest and the internet for Ikea hacks, I came across the simple idea of changing the handles on the drawers to make them look more chic. 3. Olivia Bonas Round Copper Hanging Mirror | £49 For me, injecting a bit of colour into a room is much harder than expected, but then I went into the Olivia Bonas the other week and I was in copper heaven. Even though it's not the most purse friendly shop, this hanging mirror would be a staple in anybody's bedroom. 4. M&S Fragrance Bell Jar | £12 After seeing the bell jar on Nouvelle Daily the other week, I was sold. These not only enhance the scent of a candle, but they look very simple on a bed side table or chest of drawers, perfect for when you want to add another feature to your room. 5. YorkshireLinen Basket Weave Cushion Cover | £5.99 I never used to get the obsession with cushions, removing them from the bed daily? No thanks, I just want to sleep, but since I started to put together our bedroom I have noticed that a few grey, pink and dark cushions really adds comfort and style to a room. 6. Urban Outfitters Mini Plant Greenhouse Terrarium | £30 | As an avid plant buyer and collector, I thought that I needed some new ways to present my succulents. I have been eyeing up this copper, geometric terrarium for some time now. Not only does it go along with the theme of my bedroom, but it looks chic, simple and presentable - Perfect for my growing number of succulents and cacti. I'm currently lusting over H&M's home range! So modern and simple! Can't wait to do up my new uni home.